The Russian Soyuz TMA-20 spacecraft approaches the International Space Station Dec. 17, 2010. The Soyuz docked at the station, delivering three new crewmembers for the Expedition 26 mission. This article was updated at 6:25 p.m. ET. A Russian Soyuz spacecraft arrived at the InternationalSpace Station today (Dec. 17), carrying the three newest members of theorbiting laboratory's crew. The Soyuz TMA-20 with NASA astronaut Catherine Coleman,Russian cosmonaut Dmitry Kondratyev and European astronaut Paolo Nespoli dockedat the space station at 3:12 p.m. EST (2012 GMT) after a two-dayorbital journey. The trio launched from the Baikonur Cosmodrome on the frigidsteppes of Kazakhstan in Central Asia on Dec. 15. Coleman, Kondratyev and Nespoli docked to the station'snewest port ? the Earth-facing Rassvet berth ("Rassvet" is Russianfor "Dawn"). After a series of tests to check the seals between theSoyuz and the space station, the spaceflyers opened the hatches between thespacecraft at 6:05 p.m. EST (2306 GMT). Shortly after floating through and entering their newhome-away-from-home, Coleman, Kondratyev and Nespoli called down to Earth,where their families were gathered at Russian Mission Control. "Hi Mom, it's Jamie," one of Coleman's sons radioedup. "I miss you a lot and I'll take care of Dad." "I know you will. I miss you too," she replied. Coleman, Kondratyev and Nespoli are beginning a five-monthstay in space, and as members of Expedition 26, they will participate in a widearray of research experiments and educational outreach. "Now that we have a six-person crew, we're going to tryto average 30 hours a week on various types of science," station commanderScott Kelly said in an interview conducted before the Soyuz launch. "Hopefully we'll have great results from the scientific experiments thatwe're able to do onboard." The experiments are primarily geared toward understandinghow the alien environment of space affects people, particularly over the longterm. In a preflight interview, European Space Agency astronaut Paolo Nespolisaid he will be involved in over 60 experiments in various disciplines. The crewmembers will also be required to conduct maintenanceactivities and general station upkeep. Russian cosmonauts Skripochka and Kondratyev also plan tocarry out two spacewalks to install an antenna to complete an informationtransfer system that sends large computer files to and from the space station. 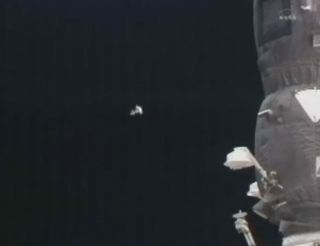 Thespacewalks are currently scheduled for Jan. 21, 2011 and late February. The station crew will also be kept busy with the arrival ofseveral different vehicles to the station. Three unmanned cargo supply vesselsare set to dock at the station in the new year. A Japanese H-II Transfer Vehicle (HTV) is scheduled tolaunch Jan. 20 from the Tanegashima Space Center in Japan, and will dock to theEarth-facing port on the station's Harmony module on Jan. 27. The European Automated Transfer Vehicle (ATV), named afterfamed mathematician and astronomer Johannes Kepler, is set to launch fromKourou, French Guiana on Feb. 15. It will then dock to the aft port of theRussian Zvezda service module on Feb. 26. The Russian Progress 41 resupply vehicle is scheduled tolaunch from Baikonur in Kazakhstan on Jan. 28 and will dock to the Pirs dockingcompartment on Jan. 31. In addition to the various cargo ships, the space stationwill also host two visitingspace shuttle missions early next year. Discovery's final mission(STS-133) is currently planned for early February, and will deliver the lastpressurized U.S. segment to the station ? a space closet that will be attachedto the nadir side of the station's Unity node. In April, the space shuttle Endeavour is also set to makeits final flight to the space station. In addition to carrying supplies,Endeavour will ferry an ambitious experiment, called the Alpha MagneticSpectrometer, to the station. The 15,000-pound (6,800-kg) cosmic-ray detectorwill be installed on the top side of the station's truss, and will be used tosearch for antimatter galaxies and elusive dark matter. During their five-month stay onboard the station, Coleman,Kondratyev and Nespoli will also take part in marking several significantmilestones and anniversaries in spaceflight history, NASA officials said. Theseinclude the 50th anniversary of the firsthuman spaceflight by Russian cosmonaut Yuri Gagarin on April 12, the30th anniversary of the first space shuttle flight, also on April 12, and the50th anniversary of the first American human spaceflight (May 5). The six-person Expedition 26 crew will spend about threemonths together before Kelly hands over command of the station to Kondratyev,who will lead Expedition 27. Kelly, Kaleri and Skripochka are set to return toEarth in mid-March, while Coleman, Kondratyev and Nespoli will live on thestation until May.